This ink is dark. It is really dark. I am not sure that I can express how dark it is. I need to try it in the driest pen that I have, which still has variation, like a Pilot Plumix, just to see how the ink behaves. In the Baoer Skywalker, there was a bit more color variation; however, this variation was really only visible when using the ink and pen lightly on the paper. Faint hints of blue could be seen in some of the thinner strokes. This review was scanned at 600dpi on an HP Deskjet F4200. It is nice. In a way, this ink is to blue what Noodler's Nightshade is to purple. 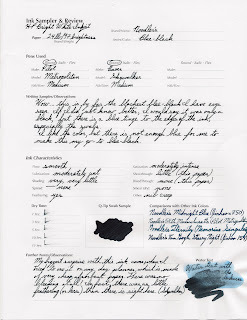 Diamine Blue-black still holds my loyalty, though, insofar as blue-blacks are concerned.